Finding new ways to control neuronal activity shows potential for treating brain disorders. Researchers, using primarily animal models, are learning how to genetically engineer neurons to produce custom-made "designer" receptors for easier and more specific manipulation -- using light (optogenetics) to activate the engineered receptors. The technology called DREADD (Designer Receptors Exclusively Activated by Designer Drugs) instead uses engineered chemicals (chemogenetics) to control the engineered brain neurons. These chemicals can be taken orally, circumventing the need to deliver light inside the brain, giving DREADD significant potential for treatment of human brain disorders. Scientists at the Intramural Research Program at the National Institute on Drug Abuse (NIDA) have discovered new clues to the successful use of the DREADD technology. It has been thought that artificially designed DREADD receptors can be activated by a metabolite of the antipsychotic drug clozapine, called CNO. However, NIDA researchers took it one step further, discovering that when CNO is administered to experimental subjects, CNO does not enter the brain, and the body actually converts it to clozapine, which does enter the brain, to activate the DREADD receptors. This discovery is important because it allows researchers using DREADD technology to know the exact way that the system works, and this information can be used to further advance the technology. It also offers clozapine, a well-studied, FDA-approved medication, as a vehicle to manage neuronal activity, since the amount of clozapine that is needed to activate the DREADD receptors is very low -- much lower than is currently prescribed to patients, and, in fact, too low to affect other receptors in the brain -- opening up new possibilities for research and treatment in humans. Gomez, J. et al. 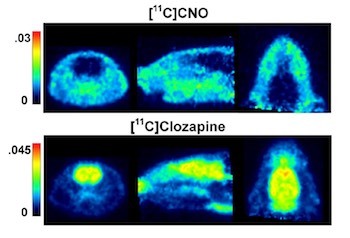 Chemogenetics revealed: DREADD occupancy and activation via converted clozapine Science.